On the morning of 28 June 2015, Sunday, after a sumptuous breakfast, everyone got into action, packing up the camp. The children got into dismantling and packing up of the three tents. It took them some time and effort to fold the first tent to fit into its bag. The parents were busy packing up the rations and the cooking equipment and also garbage disposal. We bid goodbye to the Fort William camp at about 10 AM and drove back to Wawa on the picturesque Trans Canadian Highway 17. A 83-kilometre section of the Trans-Canada Highway, between Thunder Bay and Nipigon, is renamed the Terry Fox Courage Highway to honour him for his courageous one-legged a cross-country run for cancer research – the Marathon of Hope. At the intersection of Highway 17 and Highway 11, about 10 kilometers from Thunder Bay, stands a nine foot high bronze statue of Terry, set on a 45-ton granite base, at the Terry Fox monument. The monument also offers a breath-taking view of Lake Superior. We reached Wawa by 3:30 PM and halted for lunch. After lunch, we drove for an hour to reach the Visitor Centre of the Lake Superior Provincial Park located at Agawa Bay. Being a Sunday, the centre was closed, but there was a self-serve kiosk for the campers. We filled the form to camp at the Crescent Lake Camp Ground, giving details of the vehicle, number of persons and the number of tents to be pitched. The form along with the money towards the camping charges were deposited in the box placed there. The kiosk also had literature giving out details of the camping grounds, the actions needed from the campers to protect the ecological integrity of the park. The mantra appeared to be “Leave your pristine surroundings just as you found them; take nothing but pictures, leave nothing but footprints“. We drove another hour South along Highway 17 and took a diversion on a gravel track and drove for about 5 kilometers to reach the Crescent Lake Camping area. The camping ground was empty as the camping season had just commenced with the closing of schools. The camp sites are picked based on first-come-first-serve basis and there are no reservations. Crescent Lake is an undeveloped lake surrounded entirely by the remote Superior National Forest. It is characterised by clean, blue, unpolluted, undisturbed, quite waters. This quiet campground has waterfront campsites with easy access to fishing, exploring the nearby wilderness and simply enjoying the beauty of the natural area. 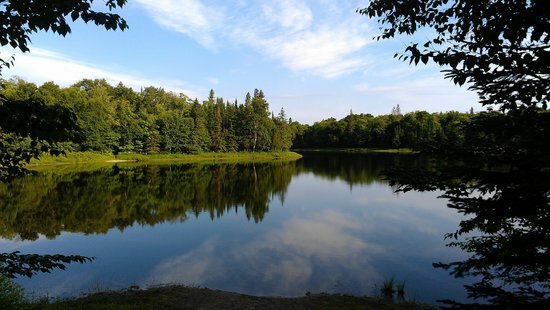 Superior National Forest, located in northeastern Minnesota’s arrowhead region, comprises of 3 million acres. The forest spans 150 miles along the United States-Canada border. Superior National Forest is known for its coniferous forest ecosystem, numerous clean lakes and diversity of plants and animals. 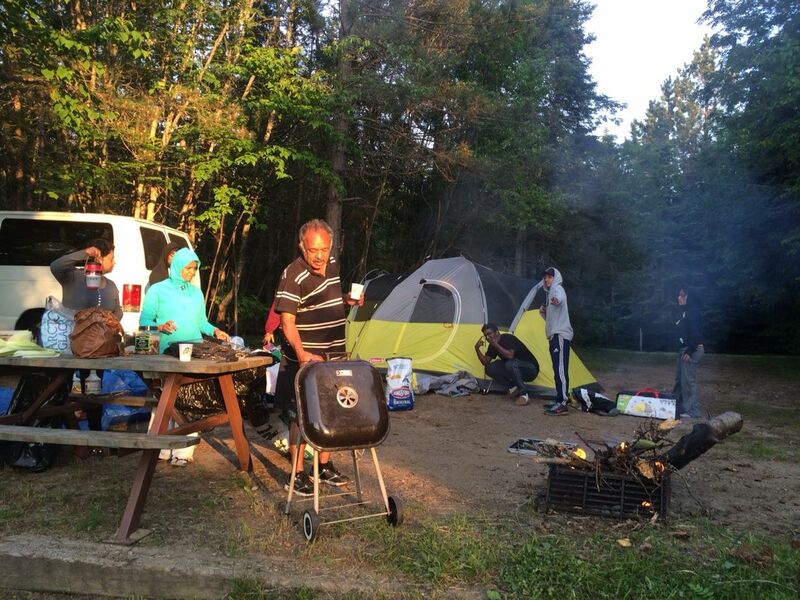 The entire campground is heavily wooded with white pines, red pines, spruce, balsam, birch and aspen. Birds and wildlife are abundant, from moose and bear to bald eagles and Canadian Goose. The campground has 32 sites situated on a peninsula that juts out into the lake, providing many sites with nice views of the water and some sites with access to the water. Picnic tables and campfire grates are provided on each site. We drove through the camping area and chose a site closest to the water front and parked our van. The children got into the act of pitching the tents. Alas! they did it in 10 minutes flat – with all the experience they had from the previous location. The parents were into setting up the barbeque to cook the dinner. After pitching the tents and unloading the necessary bedding, rations and cooking utensils, I led the children into the woods to collect firewood for the campfire. Walking on the forest ground, I felt a spongy feeling, as if walking on a rubber mattress, which I had never experienced in the coniferous woods of Kashmir or Sikkim. That was when I remembered the lesson on coniferous family of trees by our botany teacher at Sainik School, Mr AD George. He had taught us that the coniferous forests are found mainly in the Northern hemisphere, called Taiga or Boreal forests and they cover vast areas of North America from the Pacific to the Atlantic. Coniferous trees thrive where summers are short and cool and winters long and harsh, with heavy snowfall. The needle-like leaves have a waxy outer coat which prevents water loss in freezing weather and the branches are soft and flexible and usually point downwards, so that snow slides off them. The coniferous trees shed their leaves and grow new ones. The needles fall to the forest floor and form a thick springy mat. Thread-like fungi help to break down or decompose the fallen needles. These fungi provide nutrients from the decomposed needles back to the roots of the trees. The major concern for everyone was to ward off the mosquitoes and the bugs. The best methodology was to wear a track pant and a jacket with a hood. One has to apply the bug repellent lavishly to all the exposed parts. The repellants now available in Canada are surely not as messy and does not have the pungent smell as the ones I was used to while in the Indian Army. Everyone was extra conscious not to let any insect into the tents. The scariest of all was to go into the woods to relieve and one had to carry a can of repellent to keep the insects at bay. We set the campfire going and I got into cooking the dinner – mainly barbequing the meats and the veggies. The children entertained us all with their singing, mimicry, storytelling and et all. After dinner, everyone set out to take precautions to ensure that no wild animals came calling on to our site. It was mainly garbage collection and storage in the van for the night. Based on the instruction pamphlet we got from the kiosk, all the trash, leftover food, and litter were packed into a bag. All the spilled food was collected and the dishes and plates were washed and stored in the van. All the leftover rations were also placed in the van. Everyone retired to sleep after a tiring day. At night, as there was no ambient light from any human settlements and as the sky was clear, we did a bit of star gazing. The Astronomy knowledge I had gained during the Regimental Survey Officers’ Course I did in 1984 came in handy. We could locate the Pole Star, Jupiter, Constellations like the Ursa Major (Big Bear), Ursa Minor (Small Bear), Cassopia, Orion etc. We could also see two meteors shooting across the sky. Next morning, after breakfast, everyone had a swim in the lake and went on a trek along the trail in the campground. The children improvised a fishing rod, line and hook as we had not carried any angling equipment (an inadvertent omission on my part), and tried their hand at fishing, but was not a successful one. The least, they learnt to improvise. By about noon, the ladies prepared the lunch and all other got into the packing up drill. after the pack-up, it was garbage disposal at the designated site in the campground. The site again had huge animal proof bins. After lunch, we drove to Sault Ste Marie (Soo), about an hour away, to check into a hotel that we had booked. Plan your route and learn the park regulations. Pack food in reusable, leak-proof containers to minimise waste. Inspect your campsite and rest areas for trash or spilled foods. Pack out all trash, leftover food, and litter. Do not bury garbage as animals will just dig it up. Respect what you encounter. Leave any natural object where you found it. It is illegal to cut any live vegetation, harass wildlife or disturb or remove cultural artifacts in a park. Clean your boots, vehicles and gear so you do not transport invasive species. Pack food securely and hang your pack between trees, at least 6 metres above the ground or store them in the vehicle. Do not bring food of any kind into your tent. Remember that sound travels across water. Noise pollution disturbs wildlife and will diminish everyone’s wilderness experience. Chances of seeing wildlife are better if you travel quietly and camp in smaller groups. Before you leave, complete a final scan of your campsite. Ensure the fire is out, all garbage is collected and all your equipment is packed away. Leave the area in better shape than when you arrived. Dear Reji : excellent write up. I remember AD George our Botany teaching about xerophyte ( plants in desert /arid landscape. He used to say “Sunken stomata” with typical Malayalee accent as “sungen stomotae!” .